This is how he remembered it, anyway. Memory was an easily adjustable entity for Butcher. It was an essayist’s idea: Butcher wanted to produce a comprehensive portrait of a place and a time by creating and amassing as many pieces of evidence as possible. He called it his “history scheme.” His subject was the homesteading era in Custer County, Nebraska, when and where mostly white settlers, enticed by the 1862 Homestead Act, rushed in to dig houses out of the earth. 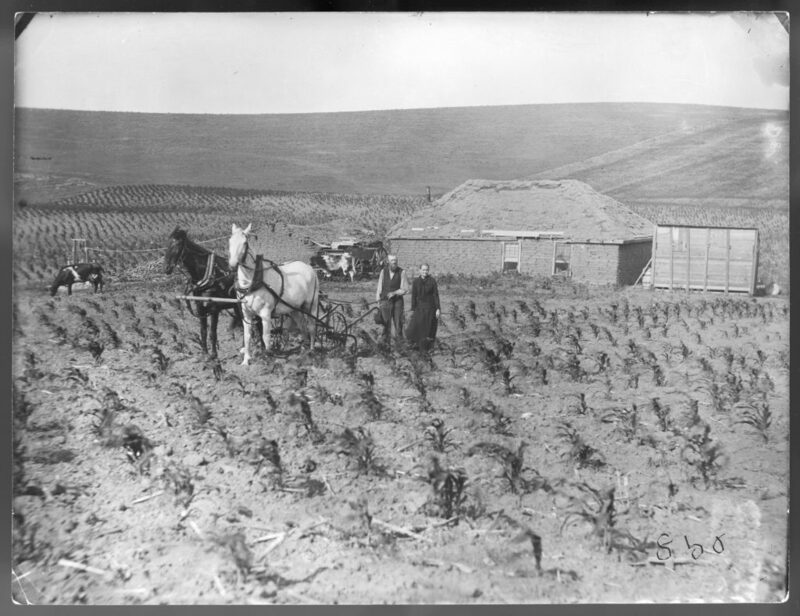 The time and place—defined a bit loosely—are familiar to contemporary readers of Laura Ingalls Wilder or Mari Sandoz or Willa Cather, who described the homesteader’s sod houses as “only the unescapable ground in another form.” There were few trees here, just two huge expanses: grass and sky. Homesteaders picked from long patches of big bluestem, buffalo, and slough grass, then began to mow, setting aside the woody plant-parts for eventual roofs. 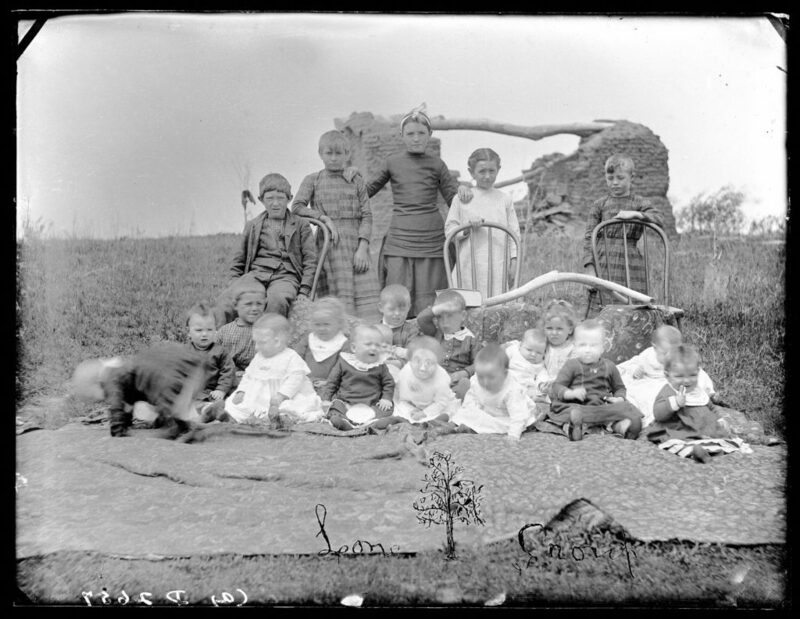 The men carved into the earth, cutting massive prisms of “Nebraska marble,” which they’d lay three-thick and tight to keep out snakes and mice and bugs. As they stacked the sod against the side of a canyon or a hill—one fewer wall to construct—their wives walked the perimeter, shaving unevenness away. If they gave the sod house, or “soddy,” a wood plank floor, arrhythmic drips from the roof would drive everyone crazy in the spring. The roof was its own animal, usually unshaven sod which bloomed in the summer and insulated better than anything else in the winter. Sometimes it housed snakes and rodents. Sometimes it caved in over the settlers’ beds or kitchen tables. 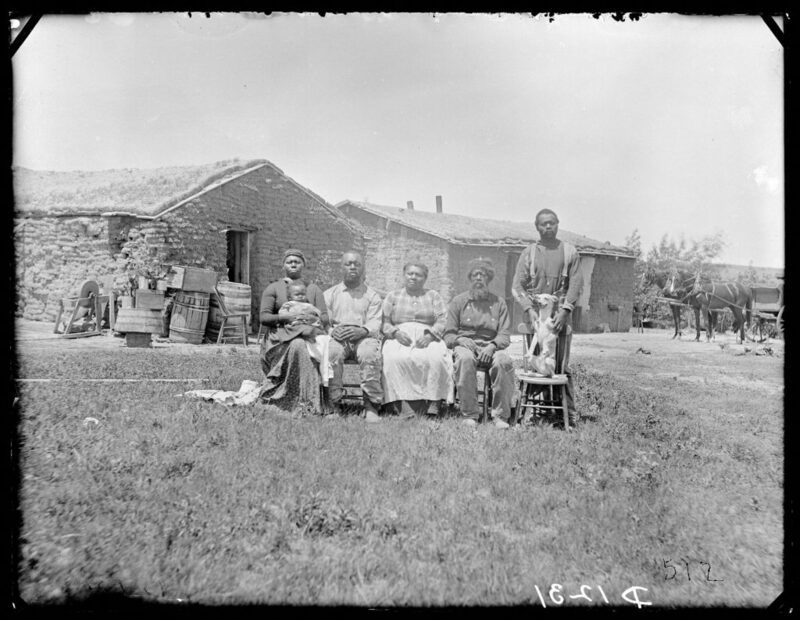 The settlers hoped to have these houses for only half a decade: the Homestead Act required that to earn their claim, which previously had been public land, the settlers had to live on it and work on it for five consecutive years. 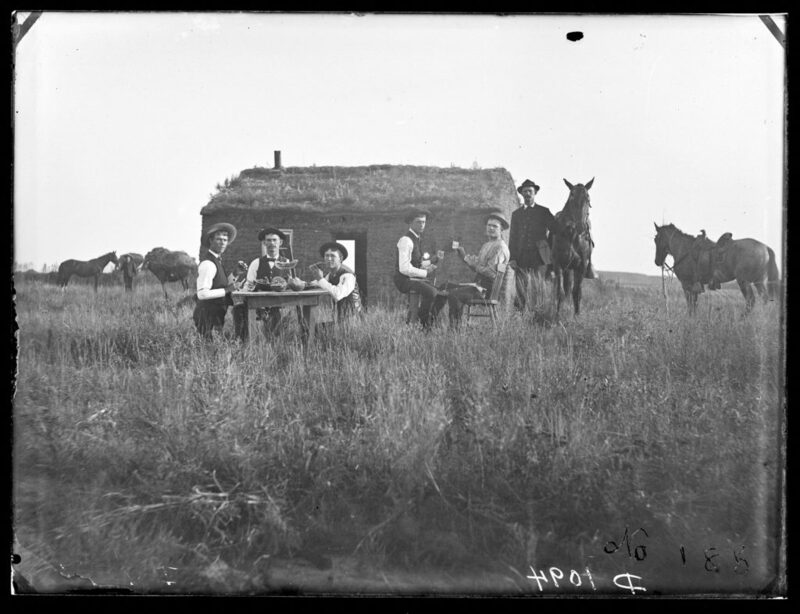 The Era of the Sod House began. Rebecca Sailor writes that “to see one photograph out of the context of the whole project is to miss one of the crucial reasons Butcher made the images. 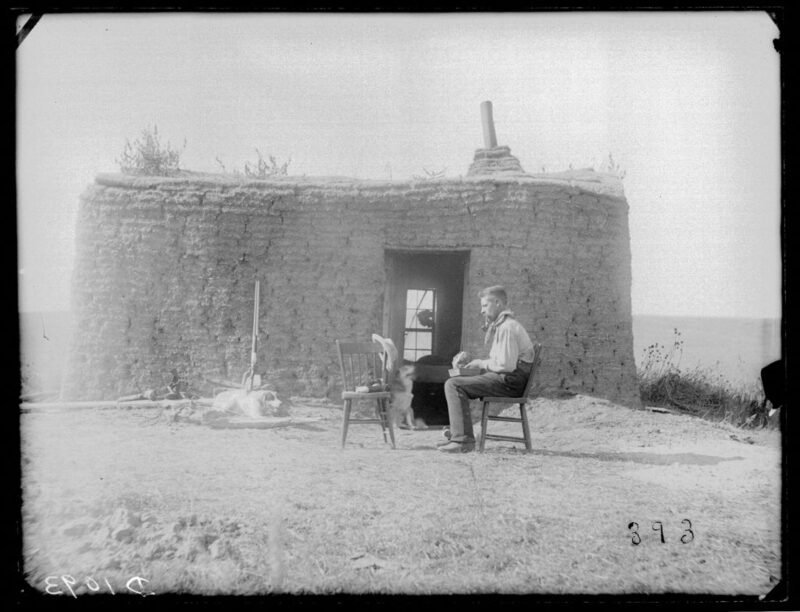 His main interest was to focus on the details of particular lives in order to create a larger document of shared experience.” But individually is how most people have encountered Butcher’s photographs; they have been plucked from the huge archive for use in Ken Burns’ The West and history books’ units on sod houses and the Homestead Act. Revisit Grant Wood’s famous “American Gothic” and you’ll even see a ghost of a Butcher photograph (Fig. 1), evidence of either coincidence or influence, but more importantly of a similar aesthetic reasoning in the men’s shared quest to illustrate life and land generally overlooked by the national consciousness. 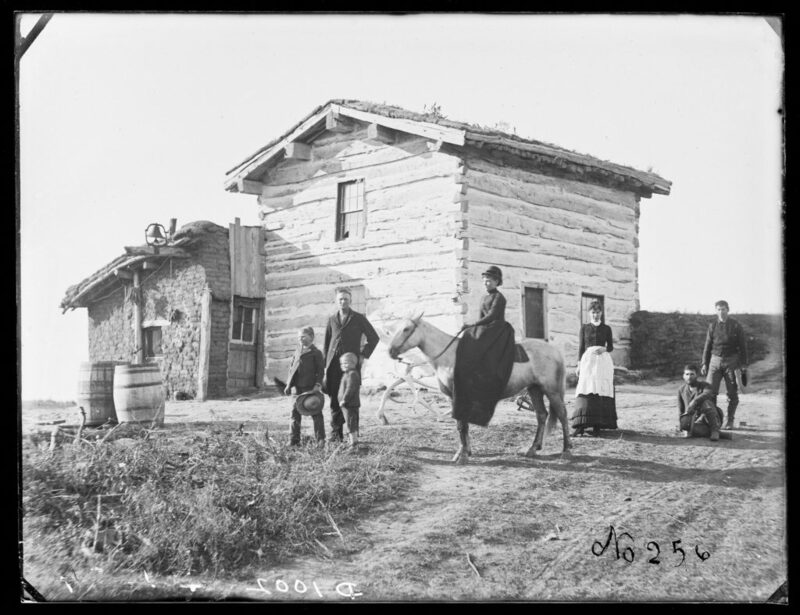 But we tend to see only one Butcher photograph at a time because a bit of destruction and a bit of invention dissolved his eureka-plan for a photo album of Custer County’s houses and faces. 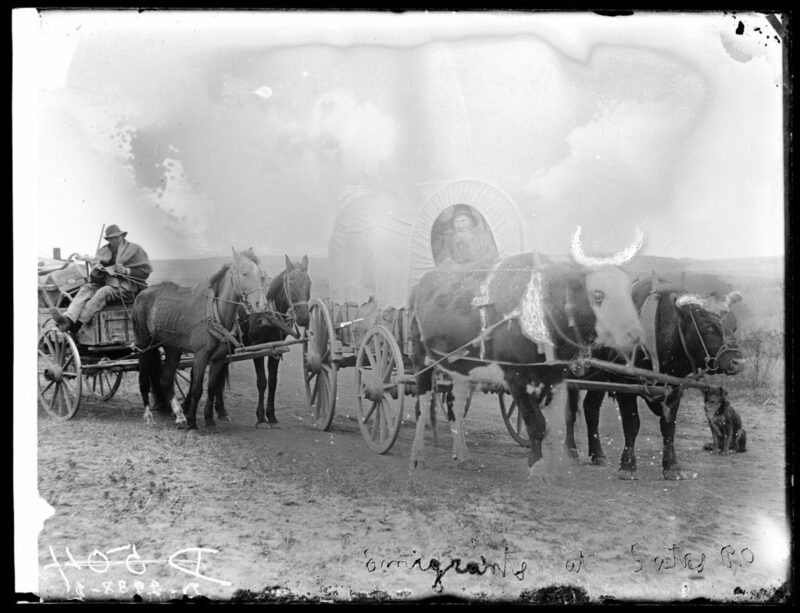 In 1899, a fire ran through the written records he had taken throughout his fifteen years bobbling along ruts in the earth to homesteads throughout Custer County, a portable darkroom attached to his wagon full of heavy glass plates, and Butcher was left unable to match many of his captured homesteaders with their biographical details and narratives. Butcher was in a bind: he had sold album subscriptions to his subjects, he had a massive collection of glass plate negatives on which their faces were imprinted, waiting and unidentifiable ghosts. He was broke. He needed to publish the thing—and the thing became a book, S.D. Butcher’s Pioneer History of Custer County and Short Sketches of Early Days in Nebraska (1901), a collection of hastily collected local tales and lore illustrated only occasionally by Butcher’s photographs, which, thanks to the popularized half-tone engraving technology, were printed amidst the text rather than “tipped in” as separate photo pages. 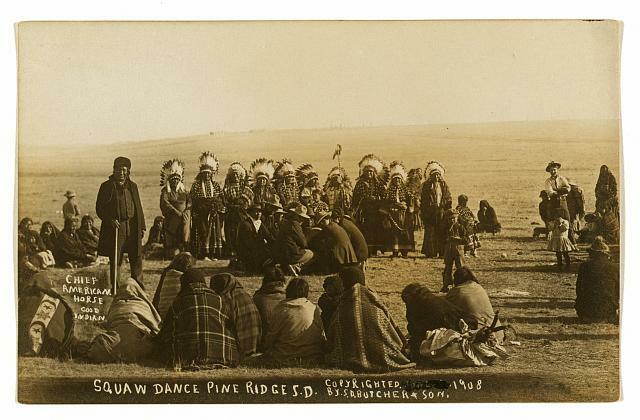 The gap between Pioneer History and Butcher’s intended album stretches very wide—and the closest we can get to envisioning his album is to examine his archive, that 3,300-large expanse of glass plates and prints through which fascinating patterns ripple like wind through the long-gone prairie. It’s an exciting and doomed endeavor, for in it are not just the ghosts of Custer County’s residents but the ghost of an unrealized essay on time and place. 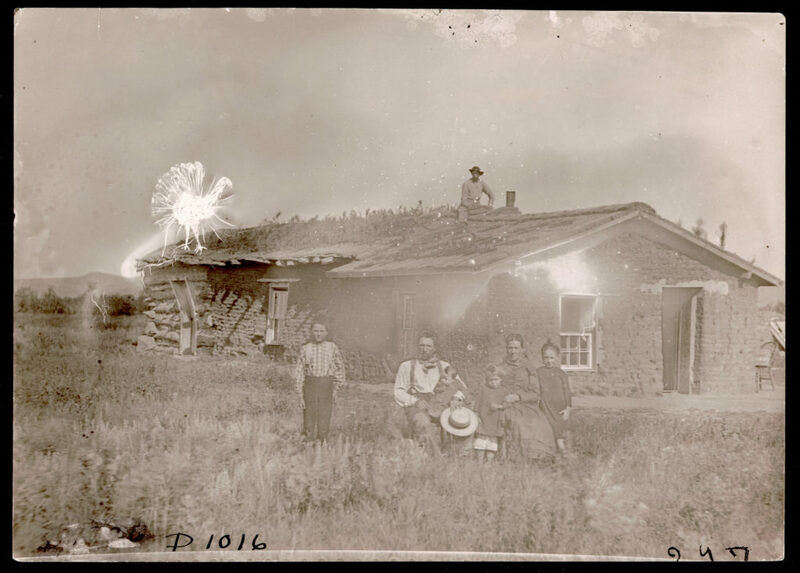 Although it never quite found life, there is evidence of a photo essay in Butcher’s obsessive capturing of Custer County’s homesteaders. There is something essayistic in his “artless” technique, his brazen invention, his obvious collapsing of truth and time. “Save a shadow ere the substance fades,” went an advertising slogan common among early photographers. 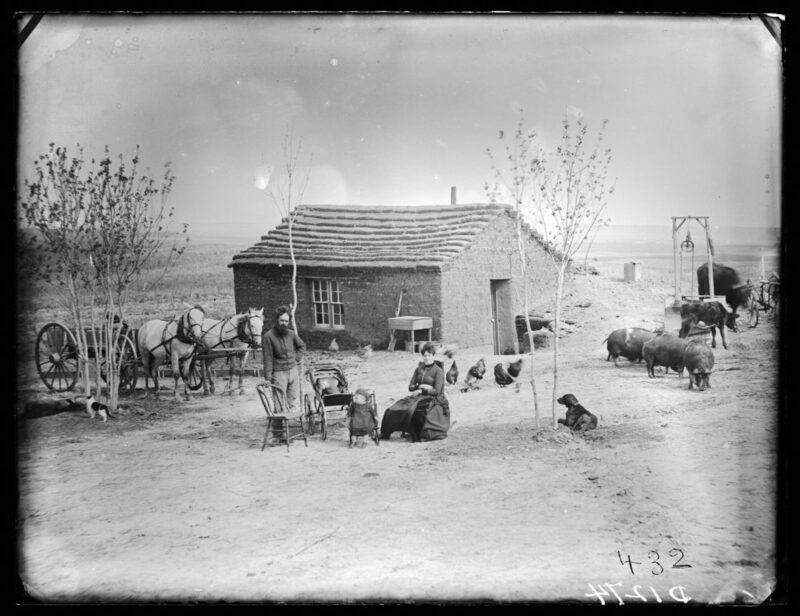 Butcher didn’t allot space for any such poetry—printed on the sides of his portable darkroom instead was “Picture Album of Custer Co.” But the movement within the former sentiment gets at the homesteaders’ thinking about their own place in time: the very act of homesteading was an optimistic one, with an implicit narrative going from sod house to wood house—“fading” (into prosperity) was a good thing. 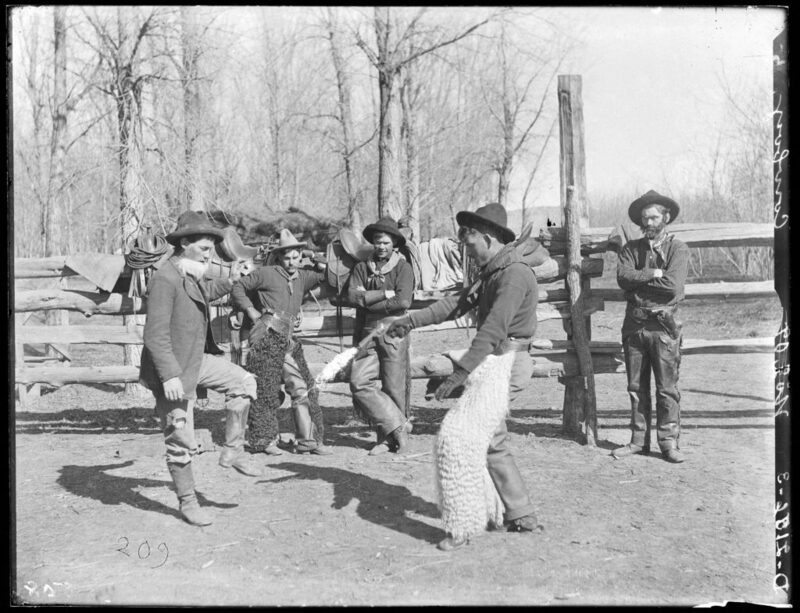 The settlers’ self-conceptions depended on it, and a commercial photographer coming around to take photos and jot down notes on every aspect of their daily lives helped to both create and reinforce this narrative. 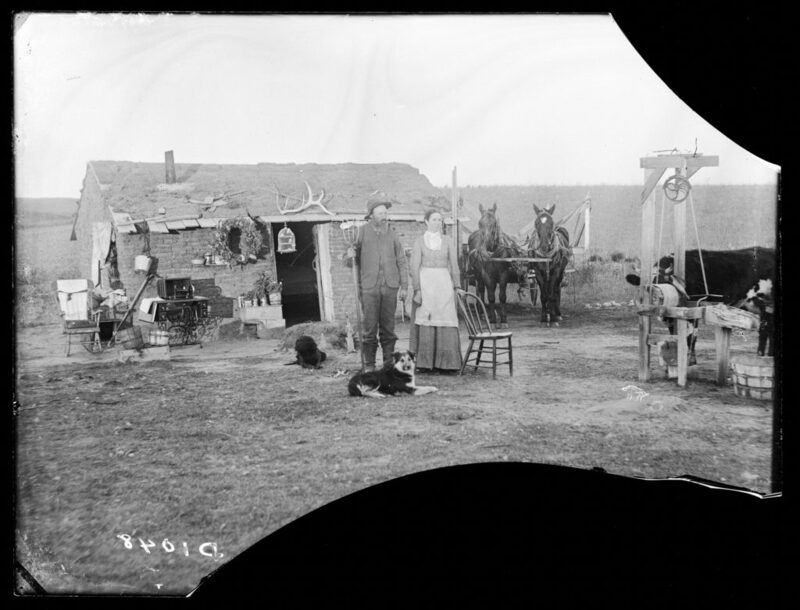 Butcher had a formula for the portion of his photographs strictly recording families and their sod houses. He tended to “depict a ‘nested’ landscape—where the immediate subject matter seems to be the homestead, its residents, and the activities of a farm seen at close range, while the larger plains loom undeniably, encompassing the smaller built environment.” This arrangement emphasized two competing themes: the success of the settlers and their relative isolation. Often nesting among them, as if to further emphasize the former, were the household’s belongings, everything from organs to chairs to melons (Butcher liked to use these frequently as a prop to indicate agricultural prosperity) dragged out from inside the soddy to sit as evidence alongside the people. Here, the people and their belongings seem to say: Here we are, and everything we own, the only things not made of earth for miles around. 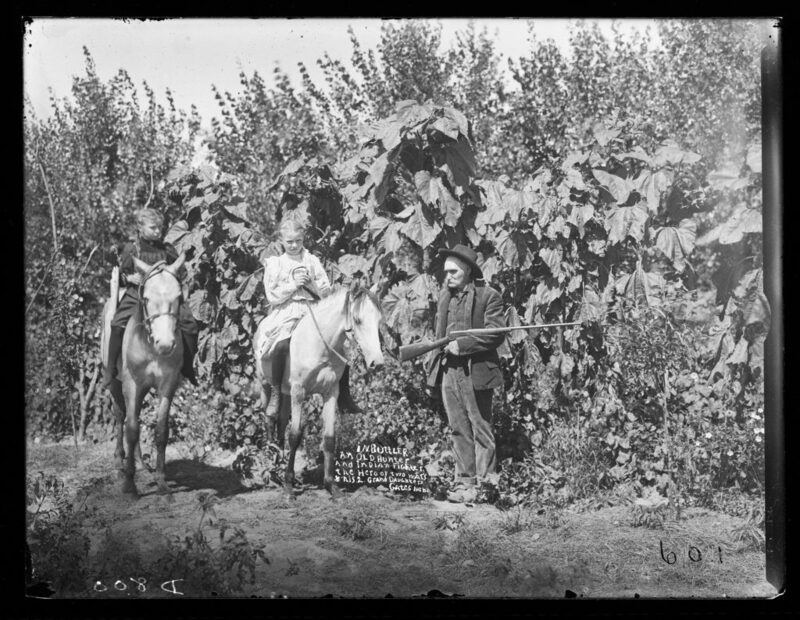 The David Hilton family near Weissert, Custer County, Nebraska. 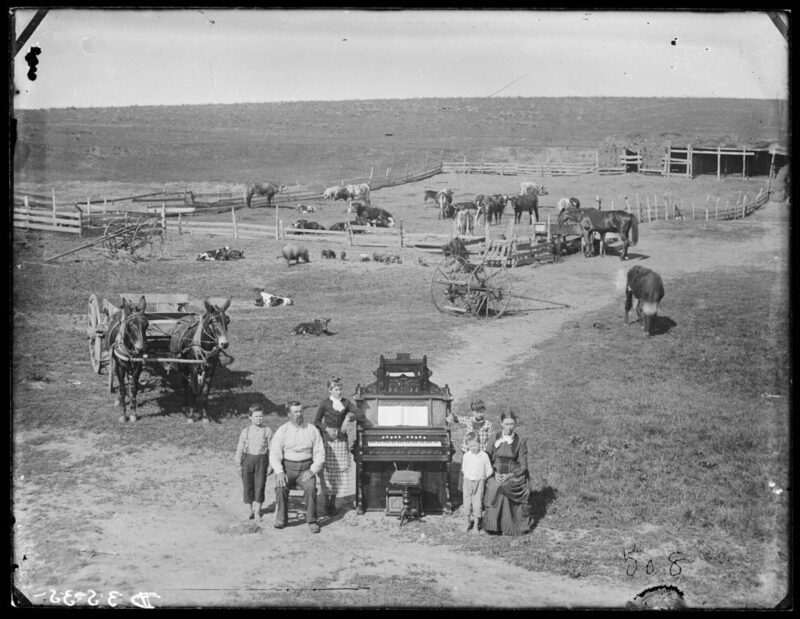 The Shores family near Westerville, Custer County, Nebraska. Using all the farm for crops – planting corn up to the front door. Custer County, Nebraska. Andy Howland, south West Union, Custer County, Nebraska. These photographs number in the thousands. Wading through them can feel as monotonous as cutting Nebraska marble. “Unquestionably he was not a prairie Stieglitz,” writes Butcher’s biographer, perhaps referencing the other photographer’s ability to create striking photographs from things as common as clouds and hands. The vastness of Butcher’s project, though, and his singular, repetitious approach, indicate an essayist’s “imitation of thinking,” in Jeff Porter’s words. The type of thinking in this case was obsessive, focused on the “settling” stage of “settlement.” Butcher’s Custer County was rapidly changing around him; the evidence was in the sod houses, temporary dwellings constructed of their surroundings and bursting with immigrants who planned to stay. For me the noise of Time is not sad: I loved bells, clocks, watches—and I recall that at first photographic implements were related to techniques of cabinetmaking and the machinery of precision: cameras, in short, were clocks for seeing, and perhaps in me someone very old still hears in the photographic mechanism the living sound of the wood. Butcher was on intimate terms with time: it was the thing he was both allied with and up against. By 1899, when the fire destroyed his written records, the audience for his book had changed: people had moved out of their soddies and into wooden houses, families had merged, old-timers had died. “The way of life that he had tried to capture had mostly passed during the time it took him to complete his book.” Butcher had spent more than a decade trying to capture a particular passage of time in American history. He dearly wanted his audience to hear the living sound of the wood, which in his case happened to be sod. This is where Butcher’s “artlessness” and embellishment come in. Essential to writing personal essays, writes Phillip Lopate, is the establishment of what he calls a “double perspective,” allowing the reader to “participate vicariously in the experience as it was lived” and to also benefit from the writer’s “mature intelligence to interpret the past.” In other words, there’s a past and a present at work, commingling occasionally to produce an essay that’s evocative and interpretive of that evocation. Is this what Butcher was doing when he drew those grasshoppers? Or those ducks? Or those trees? Ephriam Swain Finch demonstrating how he attempted to kill grasshoppers in 1876. So what to make of Butcher’s obvious, artless constructions of reality? In at least ten photos out of his thousands, Butcher drew glaring additions onto his negatives. Figures 10-12 demonstrate a frustration with or at least acknowledgement of photography’s limits: however staged, a photograph can only ostensibly demonstrate a specific moment. Butcher wanted to do more. In his alterations, Butcher seems not to be depicting one moment but two, and also, at the same, time, a coherent narrative between the two—a move straight out of Philip Lopate’s book. 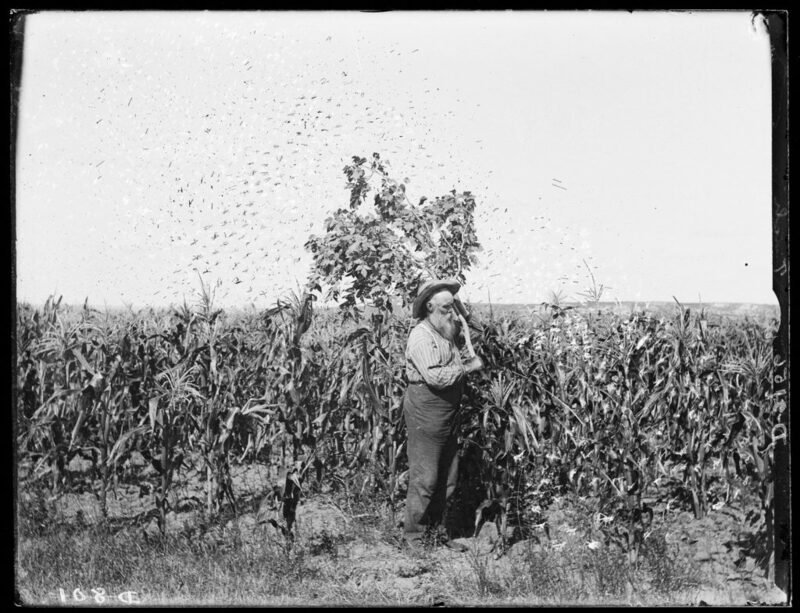 Take the photograph of Ephraim Swain standing in the field swatting at grasshoppers (Fig 10). We see Swain’s body, frozen by light and silver and salt, standing amidst his corn and holding a tree branch. There’s one moment, captured by film. We see a cloud of stick-like shapes—the grasshoppers—in the air, obviously drawn in. There’s a reference to another moment, an older past, a remembered plague. 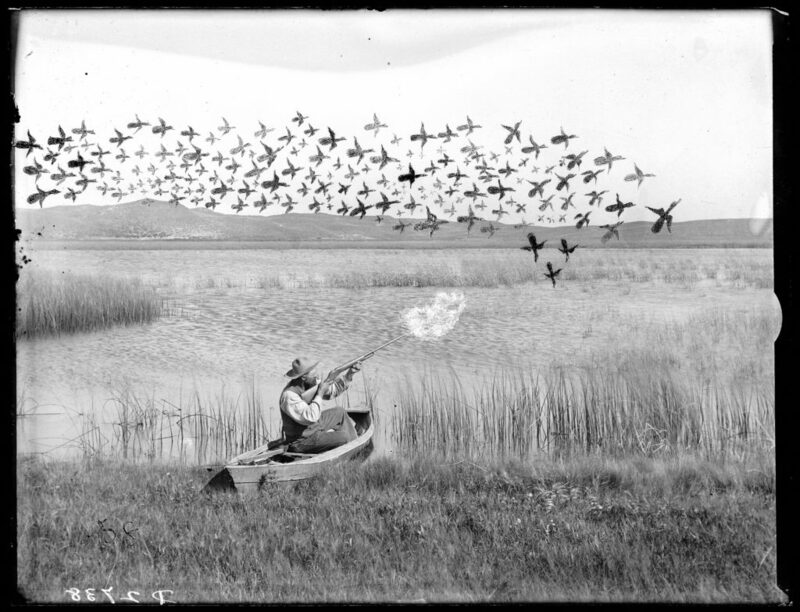 The moments, depicted in different mediums, come together to create a narrative—so Butcher would have hoped—there once was a plague of grasshoppers; this is how Ephraim Swain fought them off. “Once was” and “this is” are two important bits here. The altered photograph is an illustration of a long-ago past (the plague, a blurry memory) and a more recent past (Swain posing in his field). But it’s also much more complicated. The artlessness, the obviousness, of Butcher’s alterations create a gap for the viewer between photography and drawing, between “real” representation and fictional representation. Butcher’s crude drawings are hopeless in terms of their ability to accurately recall the past in the way we believe photography does. Revisit Figures 11 or 12 for a good look at just how crude and inaccurate Butcher’s drawings could be. Of course, Butcher couldn’t take a photo of long-gone, historically important trees or grasshoppers or ducks—they were gone. But couldn’t he maybe write in the caption something like “There used to be trees here. Take my word for it”? No. How boring. Instead, the crudeness of Butcher’s blatant alterations create a third moment—the moment in which he, the author, tampers with photographic “evidence.” The result is an amplification of what John Berger describes as “the process of rendering observation self-conscious.” In this case extremely self-conscious, the drawings look so unrealistic that Butcher’s hand and identity and role come into the picture with a kind of jolt. Again, it’s an essayist’s move, pulling out a mirror that’s been there all along. But then there are the other altered photos, bizarre to a staid documentarian’s sensibility for their flatly useless embellishments. The alterations in Figures 13-17 do not position any historical meaning onto the photograph; they seem, rather, like the kind of doodles someone might make while on a long phone call. They are, maybe, examples of what Jeff Porter describes as the essay’s unique “joy of digression.” Or maybe they are simply ornaments. 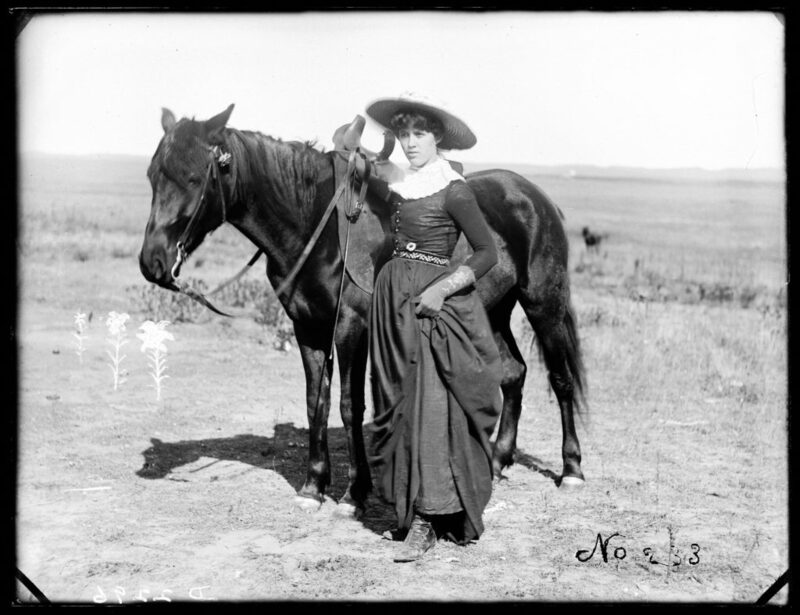 Mattie Lucas, near Merna, Custer County, Nebraska. Emigrants at the Gates P.O., Custer County, Nebraska. When the picture was delivered…Mr. Homan [the homesteader] said, “What is that?” The photographer trembling in his shoes remarked “Looks like a turkey.” Holman said it couldn’t be as the turkeys were not around. Besides they did not have any white ones. His wife spoke and said, “Yes Theodore don’t you remember me telling you to drive the turkeys away.” That settled it. But to this day I expect Hohman wonders where that old white gobbler came from. Of his altered photographs, “The Power of Suggestion” holds the most fame (that is, any at all). It seems to demonstrate a bizarre, maybe even unknowable sensibility, “a sense of humor and a lack of preciousness,” writes Butcher’s biographer, “[which] may exclude him from serious consideration by art historians…He really was just an average sort of fellow—a dreamer at that.” All this may be true. Such seemingly irrelevant embellishments as the turkey, though, also paradoxically demonstrate Butcher’s devotion to his subject: even though the photographic hand at work is artless and accident-prone, the mind behind it doesn’t care much—it remains playfully dedicated to the task at hand. There is a looseness to Butcher’s approach, in other words—a looseness with fact and with representation—that hints at Butcher’s connection to his work and to his subjects. It is human, exploratory, opinionated, and irrelevant. And often, his embellishments just cover up shoddy work (the baby’s face in Fig. 17). 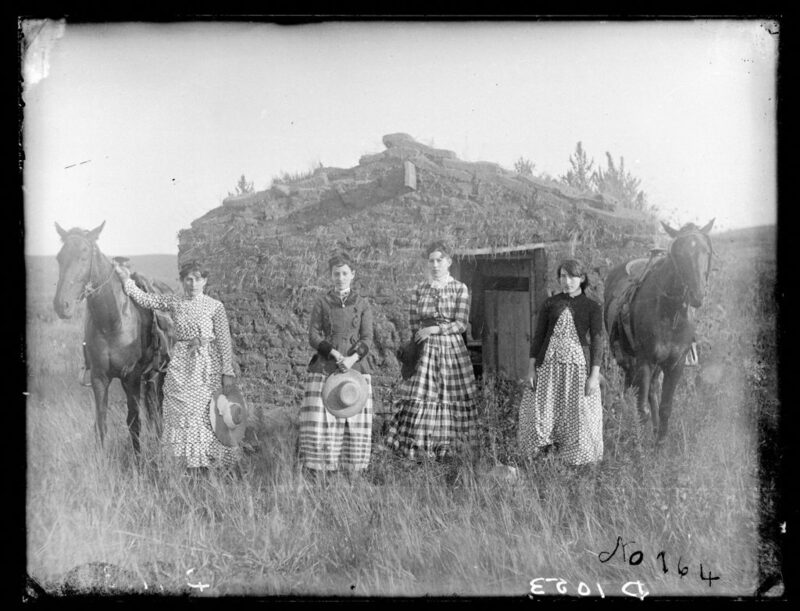 Butler and his Granddaughters, near Gates, Custer County, Nebraska. The pictures’ magnetism is irresistible…It was as if he were a twentieth century man dropped onto the nineteenth century Nebraska plains, a man who wanted to preserve what he knew would be lost for those he knew would follow. At a time when sod houses were at every hand and frame and brick houses were the rarities, Butcher was nonetheless interested in sod houses. It is like someone today spending his time and fortune new car chromework or development houses. We have now, because of Butcher, a population of faces and houses and sometimes names in the grass, evidence not of some truth but the reflection of a narrative Butcher and his fellow settlers bought and sold. It’s an ungainly, numbing, and at times obvious collection of photographs, and the pieces which remain lodged in a viewer’s mind are not just Butcher’s surprising embellishments and alterations but the figures of people who stood outside their temporary houses, just pieces of the earth, and dragged their belongings out there too, in order to be seen as settlement, as unchanging fact. “My first house in Nebraska, 1880. 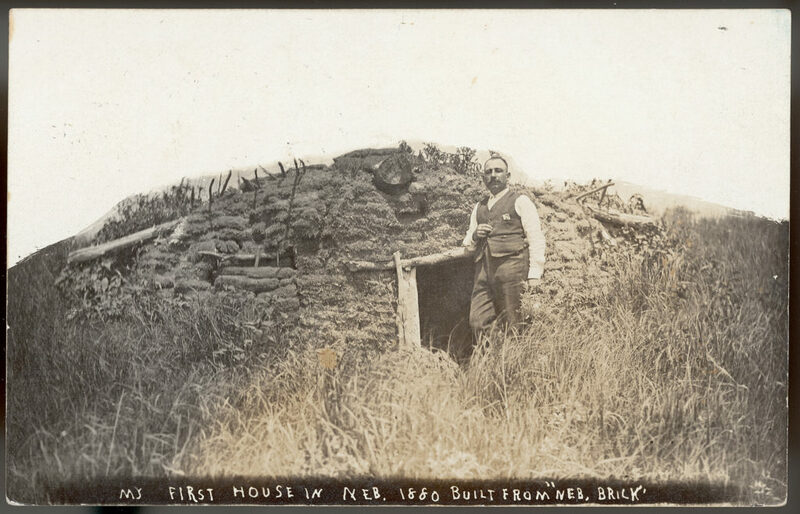 Built from ‘Nebraska brick’.” Solomon Butcher with his own ill-fated sod house. Barthes, Roland. Camera Lucida: Reflections on Photography. New York: Hill and Wang, 1981. Print. Berger, John, and Geoff Dyer. Understanding a Photograph. New York: Aperture, 2013. Print. Butcher, Solomon D., and John E. Carter. Solomon D. Butcher: Photographing the American Dream. Lincoln: U of Nebraska, 1985. Print. Butcher, Solomon D. S.D. Butcher’s Pioneer History of Custer County: And Short Sketches of Early Days in Nebraska. Broken Bow, Neb. : Merchants Pub., 1901. Print. Cather, Willa. O Pioneers! Boston: Houghton Mifflin, 1913. Print. Dahlgren, Anna, Dag Petersson, and Nina Lager Vestberg. “The Album as a Site.” Representational Machines: Photography and the Production of Space. Aarhus: Aarhus UP, 2013. 201. Print. Foster, Patricia, and Jeffrey Lyn Porter. “From A History and Poetics of the Essay.” Understanding the Essay. Peterborough, Ont. : Broadview, 2012. N. pag. Print. Lopate, Phillip. “Reflection and Retrospection: A Pedagogic Mystery Story.” Fourth Genre: Explorations in Nonfiction 7.1 (2005): 143-56. Web. Morris, Errol. Believing Is Seeing: Observations on the Mysteries of Photography. New York: Penguin, 2011. Print. Sailor, Rachel McLean. 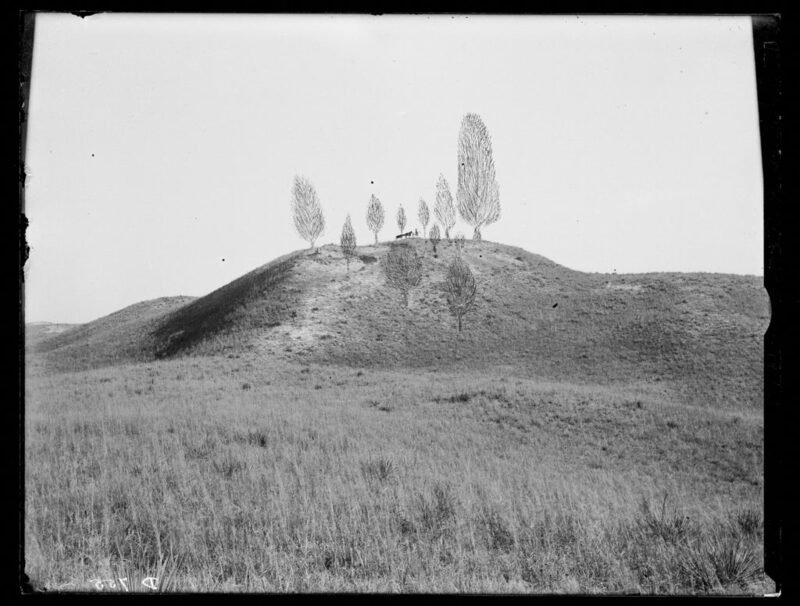 Meaningful Places: Landscape Photographers in the Nineteenth-Century American West. Albuquerque: U of New Mexico, 2014. Print. Talbot, William Henry Fox, and Beaumont Newhall. The Pencil of Nature. New York: Da Capo, 1969. Print. Welsch, Roger L., and Solomon D. Butcher. 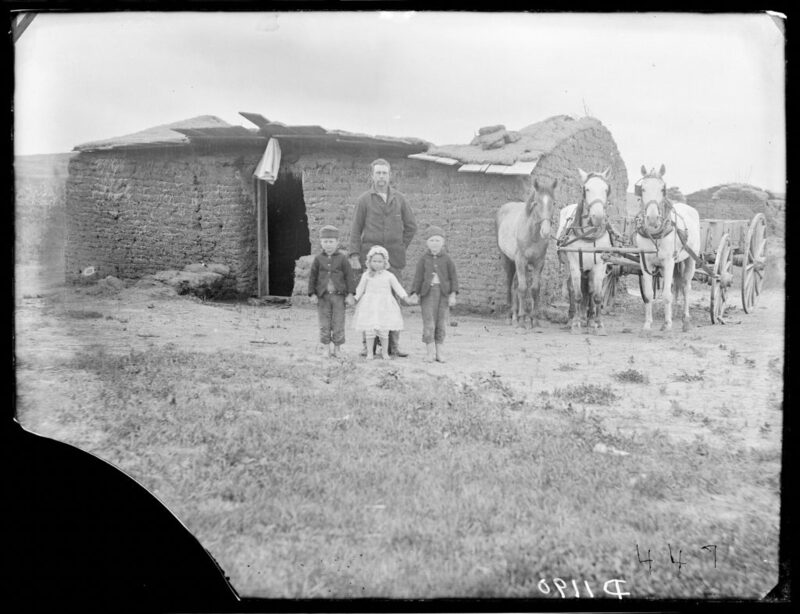 Sod Walls; the Story of the Nebraska Sod House. Broken Bow, Neb. : Purcells, 1968. Print. Lucy Schiller’s work has appeared in The Rumpus, The San Francisco Bay Guardian, ZYZZYVA.org, The Billfold, and The Riveter. She studies nonfiction as an Iowa Arts Fellow at the University of Iowa.